Soda Jerks now offers a unique behind the scenes tour of the soda fountain. Learn the origin and history of the Soda Jerk and the wonderful creations we make. Hosted by Kevin McCafferty (third generation Soda Jerk) and our finest team of Soda Jerks. The tour begins with a brief background of the origins of the Soda Jerk and the engine that creates the magical drinks, the soda fountain. The tools of the trade that accompany this lost art along with the famous age old classic desserts will be described in great detail. Given our location within the historic landmark Carousel building on the Santa Monica Pier, a brief history of the Carousel building will also be touched on. The demonstration portion of the tour will include making the following three items: a hand pumped Cherry Coke, a classic chocolate ice cream soda and a Brooklyn New York favorite Chocolate Egg Cream. A sampling of each item will be provided and substitute items (such as Dr. Pepper, Squirt, 7-Up, Root Beer Floats, etc. ), can be made upon request. 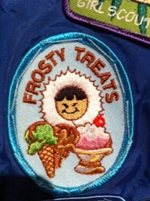 The last and most popular part of the tour includes a choice of any one scoop kid’s sundae or kids float for the kids tour and a choice of any two scoop sundae or specialty drink (ice cream soda) for the adult tour. The tours typically run about 30 minutes long and would be perfect for school field trips, Girl Scout outings, Boy Scout outings or seniors looking to relive the good old days. 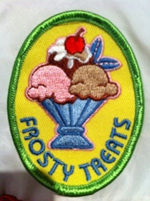 The Soda Jerks Fountain Tour can be used to fulfill Girl Scout “Fun Patches” (see fun patch examples below). Minimum tour size of 5 kids or 5 adults, tours offered Monday to Friday from opening to 1:00 PM and Saturday and Sundays from opening to 12:00 noon. To book your Soda Jerks Fountain Tour, give us a call at 310-393-SODA (7632) or email us.